Here's a post from my husband. He shared it on Facebook. Just another day in our SMS life. It's time for a Smith-Magenis Syndrome snap-shot of the day. Literally! It looks like one of those funny pictures that explain why you don't want to have kids and, on the surface, that's exactly what it is. A little kid making a big mess. But there's more here than meets the eye. 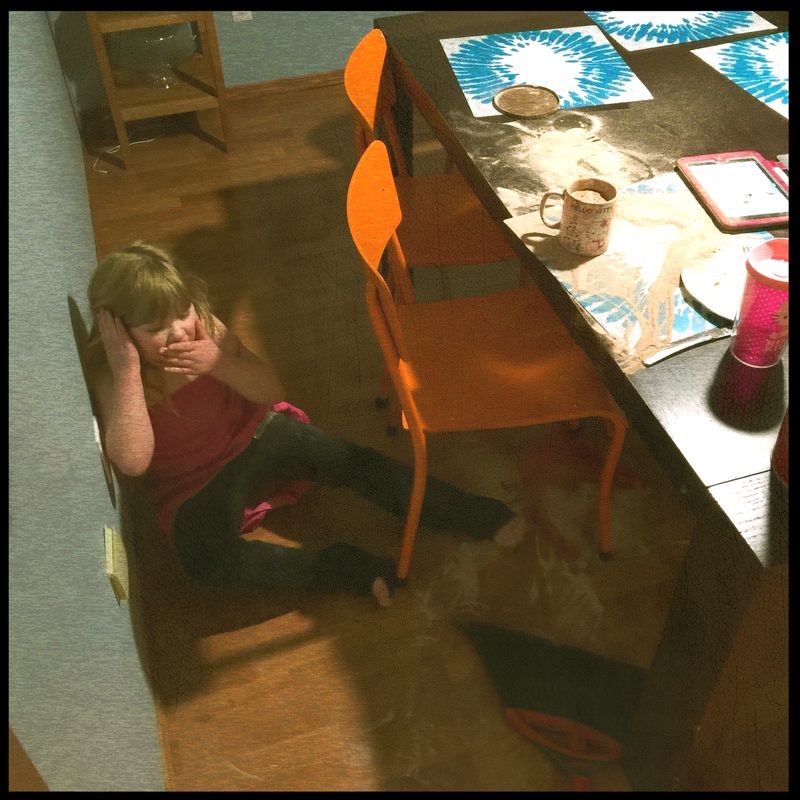 Finleigh is fiercely independent (a common SMS trait) and was trying to make herself some (cold) hot chocolate, made a huge mess, and was trying to clean it up with the broom when she called us in to help. Notice the lack of table cloth? Finleigh bites holes in them (and the table too if you look closely). See the plastic sippy cup? She knocks over all cups without lids and breaks glass ones. She once bit a glass. And broke it. The ceramic mug would inevitably have been knocked over or broken if she'd managed to finish making the (cold) hot chocolate. The plastic plate? She likes to throw those and we got tired of buying new ones and cleaning up glass. And plastic hurts less when you're the target. On this day, I'd left her dinner on the table because she refused to come and eat with us. But I knew she'd get mad if it wasn't there when she came looking and a meltdown would ensue. So she ate cold food at around 7:30. Then she wanted the (cold) hot chocolate. That's her iPad on the table. With her short attention span, we have a hard time keeping her at the table and this helps her stay long enough for us to get through a meal. It's outfitted with the strongest case we could find for when it gets thrown against the wall or covered in hot chocolate powder. See the wall? Covered in a variety of food and beverages in addition to the marks/holes from her chair/iPad/dishes/body parts hitting it? The scratched up chairs are cheap, spray painted, cast offs because she'll ruin whatever we use so there's no point in buying better ones. Those clothes she's wearing? She changed into them, by herself, about an hour before. After urinating in her other ones. A rarer occurrence than it used to be besides the need for pull-ups at night. Lastly, there's Finleigh. With a cocktail of meds running through her system. On the floor. Having a meltdown. Wanting to help clean up. But not. But wanting to. But not. Covering her ear as she's done since she was a baby. I had to lie to her about what I was taking a picture of because if she thought it was of her, she would have lost her mind. Just a glimpse into our kind of normal.